Homeland Security Secretary Kirstjen Nielsen, left, listens as Attorney General Jeff Sessions, right, speaks during a meeting in Washington, Aug. 16, 2018. A group of former national security officials is pushing back against a controversial Trump administration report on the link between terrorism and immigration, saying the report gives the false impression that immigrants are responsible for the majority of terrorist attacks in the United States. In a letter Thursday to U.S. Attorney General Jeff Sessions and Secretary of Homeland Security Kirstjen Nielsen, the officials, including former Director of National Intelligence James Clapper and former White House counterterrorism czar Richard Clarke, expressed concern about "misleading statements and omissions" in the January 2018 report and urged the administration to address lingering questions about them. "Overall, the report appears designed to give the misleading impression that immigrants — and even their citizen family members — are responsible for the vast majority of terrorist attacks that have occurred in the United States, whereas statistical studies and our experience have shown no identifiable correlation between 'foreignness' and terrorist activity in the past 15 years," the 18 former officials who served in both Democratic and Republican administrations wrote. 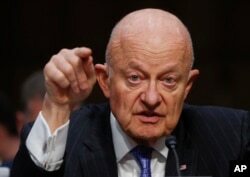 FILE - In this May 8, 2017, file photo, former National Intelligence Director James Clapper testifies on Capitol Hill in Washington, before the Senate Judiciary subcommittee on Crime and Terrorism. The report in question was released by the Departments of Justice and Homeland Security and said three in four individuals convicted of international terrorism-related charges since the attacks of Sept. 11, 2001, were foreign born. President Donald Trump ordered the report as part of a March 2017 directive imposing a travel ban on citizens of six predominantly Muslim countries. The directive asked for an initial report on "foreign nationals" in the United States who have been charged with terror-related offenses in the United States. The report instead focused on "foreign born" terrorism defendants, a broader category that included 148 naturalized U.S. citizens, as well as foreign terror suspects extradited to the United States for prosecution on crimes committed overseas. It showed that 402 of 549 individuals convicted of terrorism charges in the United States between Sept. 11, 2001, and Dec. 31, 2016, were foreign born. Critics blasted the report for exaggerating the threat of terrorism posed by foreigners by substituting "foreign born" for "foreign national," saying without the substitution the report would have shown that fewer than half of terror convicts were foreign nationals. They also criticized the report for leaving out individuals convicted of domestic terrorism, who commit the vast majority of acts of terror in the United States. "What we've seen come out of the Department of Homeland Security has been patently false and misleading," Matt Olsen, a former director of the National Counterterrorism Center, told VOA. "Not only is that wrong on its terms but it also undermines our counterterrorism and national security efforts because it provides a misleading picture of the people who are really responsible for terror," said Olsen, who was among the officials who signed the letter. "The focus needs to be on people who are here who are being radicalized, not the country that they were born in." 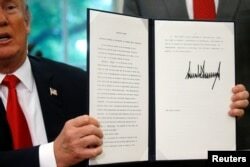 U.S. President Donald Trump displays an executive order on immigration policy after signing it in the Oval Office at the White House in Washington, June 20, 2018. The report led to formal complaints by three rights organizations. Muslim Advocates, Protect Democracy and the Brennan Center for Justice first petitioned the departments of Justice and Homeland Security to correct or retract the report and later sued the agencies for violating the Information Quality Act, a little-tested law that requires government reports to meet standards of "utility, objectivity and integrity." Justice and Homeland Security officials responded to the organizations recently that they saw no reason to correct or retract the report under the Information Quality Act. The rights' groups appealed the agency decisions on Thursday, drawing support from the former security officials. Calling the report "misleading," the former officials urged DHS and DOJ "to reconsider their responses to the concerns" about the report. Homeland security spokeswoman Katie Waldman said via email: "We cannot view counterterrorism through a pre-9/11 lens. The Department of Homeland Security uses historical data to inform its approach, but if we only look at what terrorists have done in the past, we will never be able to prevent future attacks." Sirine Shebaya, a senior staff attorney for Muslim Advocates, said the agencies likely will reject their requests again. "We hope that the Department of Homeland Security and the Department of Justice will take another look at these reports and will correct or retract them," Shebaya said. "What's more likely to happen is that we're going to wait for their response, their response is going to be unsatisfactory, and we're going to go back to court to fight this out."